Heading out on a road trip in the US? Here are ten little-known facts you should know before driving through tunnels, bridges and tolls roads in the United States. 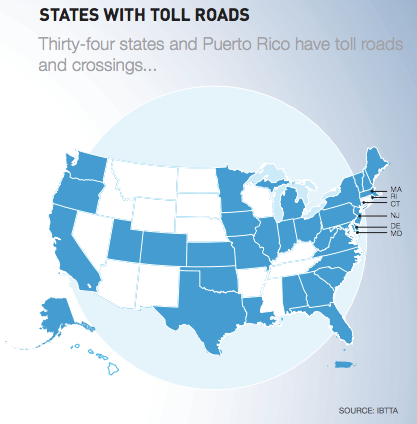 Yep, tolls are no longer limited to the northeast or Chicagoland, they’ve now spread to 34 states — with a number of other states considering adding them. 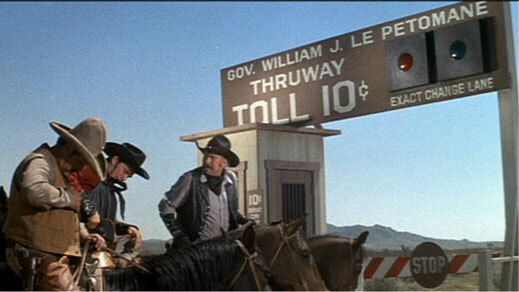 In fact if you’re planning a cross-country road trip you might be shocked to learn you could encounter tolls in every single state save one; Nevada. If you were saving quarters to pay for toll tunnels and bridges they may be better spent at the arcade as some toll facilities no longer accept cash, including the Tappan Zee Bridge in New York that just switched to all-electronic tolling. In fact cashless toll systems are becoming increasingly popular across the US, and if go through one without the right transponder you’ll arrive home to find a bill in the mail — and likely a service fee as well. 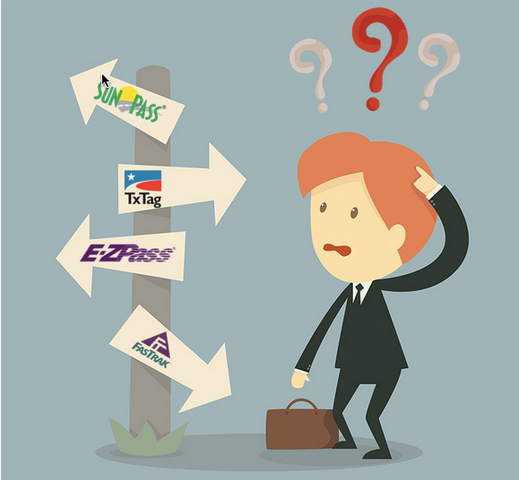 Warning to travelers visiting the US from overseas, don’t expect an E-ZPass or SunPass transponder to cover you across the entire US as each only work within their respective region (E-ZPass in the northeast and upper midwest and SunPass in the southeast). In fact there are over 50 transponders in the US and Canada — from TxTag in Texas to K-TAG In Kansas to FasTrak in California — and none of them work across all states. If you setup a transponder account to cover travel for a specific region, you might be surprised to learn that you may still encounter toll facilities within that region that won't accept it. For example, even as ubiquitous as the E-ZPass systems is in the northeast US, there are still toll facilities that do not accept it. 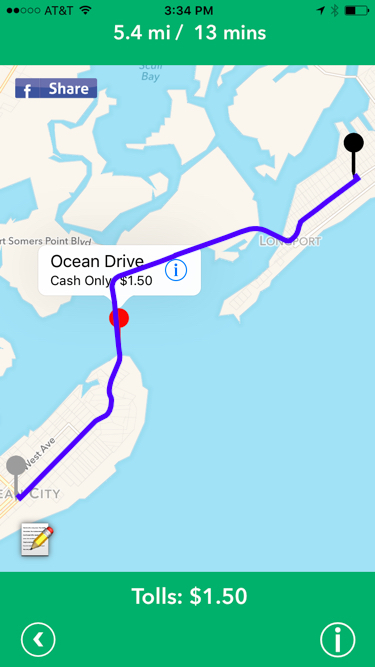 For example, if you're heading to the beaches on the south Jersey shore there are several toll bridges that only accept cash, such as the Ocean Drive bridge connecting Ocean City to Longport. 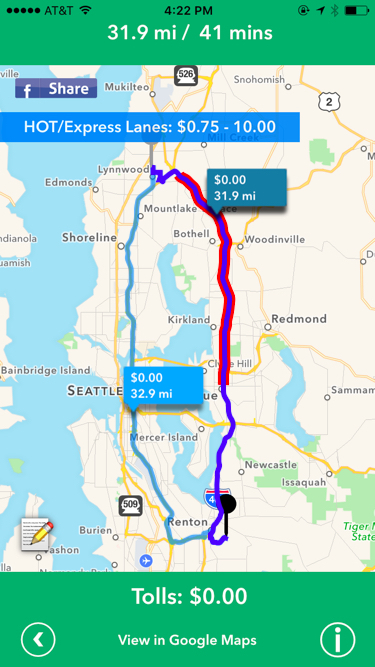 Because none of the major mapping or GPS apps provide toll cost information, it's impossible to tell if there is a cheaper route available that will save you money on tolls. 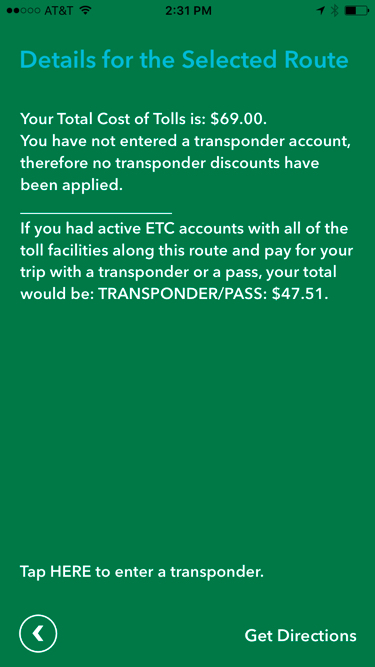 However when viewing routes through the Tollsmart app these costs are displayed, and often reveal that significant savings can be achieved by taking an alternate route than may add on only a little extra driving time. For example, driving a car from Philadelphia, PA to Chicago, IL will cost $69 in tolls (cash rate) but there is an alternative route that will save you nearly $30 and only require an additional 15 minutes of driving time. That's saving nearly $2 per minute of extra driving time! Establishing a transponder account can save you a lot of money through discounts, however having one doesn’t mean you’ll automatically receive the discount everywhere you travel — even within the transponder’s own regional network. For example, if you established an E-ZPass account with New York you won’t receive discounts as you travel through toll facilities in Maryland as those only apply to holders of Maryland E-ZPass accounts. 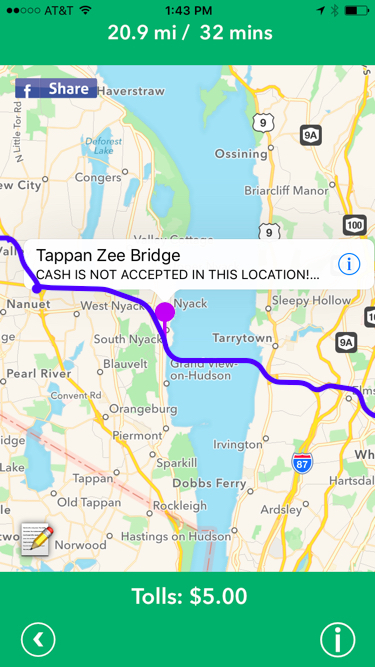 Conversely, holders of Maryland E-ZPass accounts won’t receive discounts driving on the NY State Thruway, but they will for the tunnels and bridges entering New York City from New Jersey. Confused Yet? That said, you can still save a substantial sum of money using a transponder as discounts can exceed 30% for some trips. 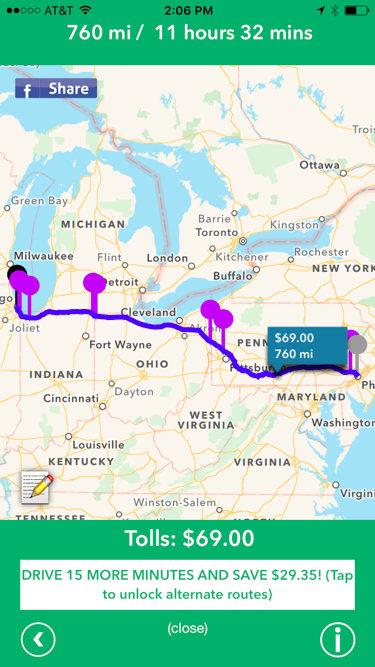 For example, you can save up to 31% ($21.45 off the $69 cash rate) on that trip from Philadelphia to Chicago by using an iPass or an E-ZPass, regardless of the state it is issued in. Now that gas prices have plummeted to a national average of around $2 per gallon, if your summer travel takes you through a heavily tolled region like the northeast US you’re likely to spend more — and possibly substantially more — on tolls than gas. 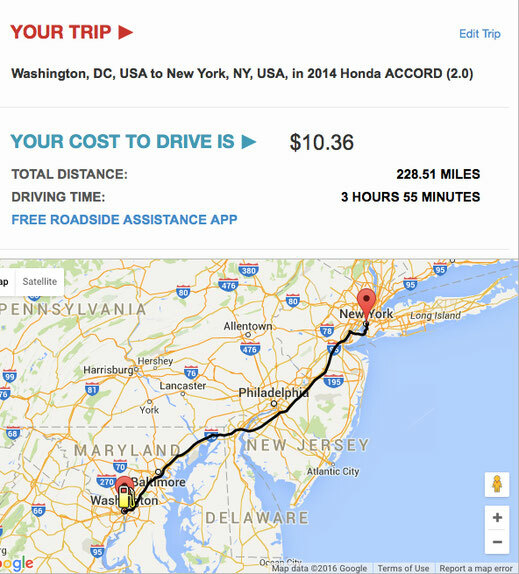 For example, a one-way trip from DC to NYC in a 2014 Honda Accord will only cost you around $10 in gas according to the website Cost2Drive, but $44 in tolls (cash rate) —more than 4X the amount! Many travelers may be aware that certain tolls have peak and off-peak hourly pricing, but few know there are also peak and off-peak seasonal toll pricing. 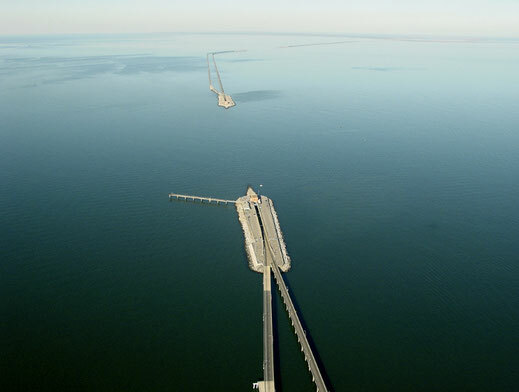 For example, the Chesapeake Bay Bridge & Tunnel, which is an engineering masterpiece) has peak season pricing that runs during the weekends — but only during the summer months. A growing trend in tolling is the conversion of High Occupancy Vehicle lanes (HOV) to tolled (HOT) lanes. These lanes — also known as Managed or Express Lanes— allow solo drivers to drive on HOV lanes for a fee, and the fee is determined based on traffic congestion, and can change as frequently as every 5 minutes. These lanes offer a great paid option for avoiding rush hour traffic near major urban centers like Washington, DC, but note that most require a transponder even if your passenger count qualifies you for HOV status and no charges will apply. Just because you’re from out-of-state doesn’t mean the tolling authorities can’t track you down and impose stiff penalties and fines for unpaid tolls. 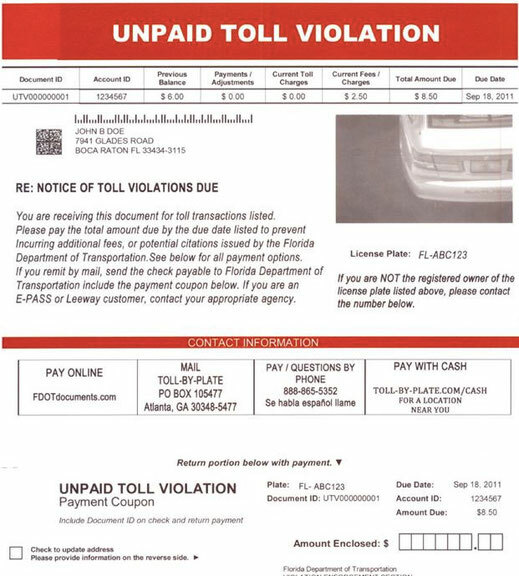 In fact an increasing number of states are cooperating to ensure compliance across state borders — and many have passed laws that impose tougher penalties on toll evaders, including withholding vehicle registration until the tolls and related fines are paid in full, even if the toll violation occurred in another state. Over the past ten years mileage of toll roads in the US has grown at triple the rate of systemwide roadway mileage overall — a trend showing no sign of abating. In fact it’s possible that one day in the near future every single mile you drive may be tolled as states like Oregon and California test road usage fee models where drivers are charged a fee for every mile driven.